kona run 2013 | Counting my cookies... & Eating them too! I ran 5K, and no one was chasing me! 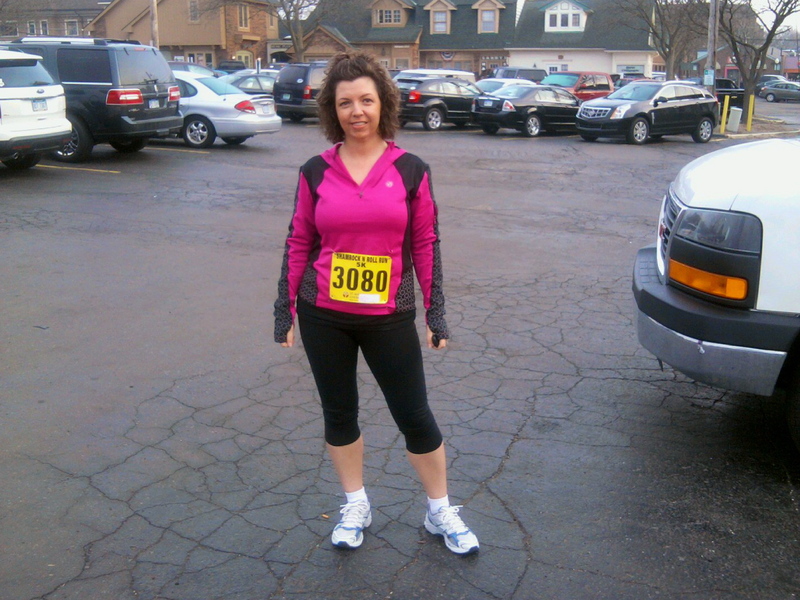 Saturday I ran the 5K race “Kona Run” in Northville! That’s right, I ran it!! My official race time was 38:14 which is, by far, a personal best for me! If you’ve followed my monthly fitness stats at all, you’ll know that I am really not a “runner”. I’m more of a walker who sort of wishes she was a runner. But, my short little legs have a hard time building up too much speed (I am only 5’2″!). And I used to be an avid hiker. I have a knee injury from a hiking adventure many years ago which likes to flare up and cause me much grief when I push myself too hard trying to run. 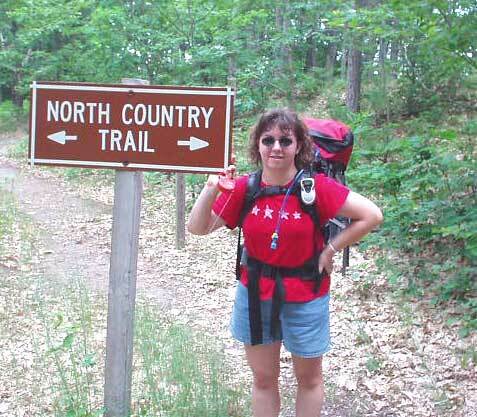 Somewhere around 8 or 9 years ago I did a 22 mile hike, in the woods (read: hills! ), wearing a 30 lb. 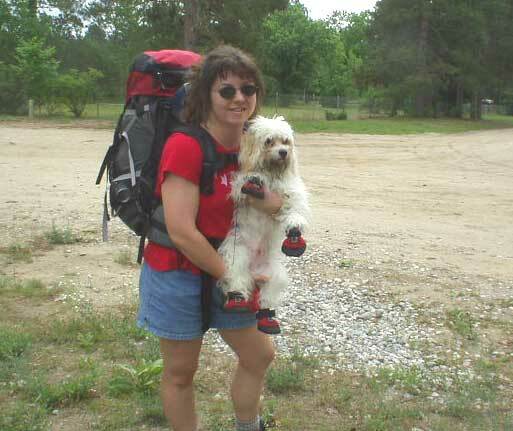 pack on my back, and with my dog – who loved the hike but tired out easily and repeatedly wanted to be carried! About 13 miles in, I injured a tendon behind my right knee and it became VERY painful to even walk. Every step was a new experience in pain. Unfortunately, I still had almost 10 miles to go to get out of the woods, there was no choice but to continue. 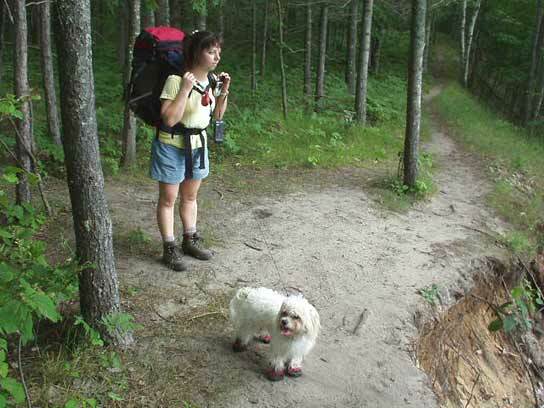 My hiking partner also had a full pack and really wasn’t able to assist with my pack. I hiked in pain and in tears for hours! My doctor diagnosed it as tendonitis and the problem with it is that while it heals up, it never really goes away. It is easy to trigger a flare up. About 6 years ago I had dabbled with running and found myself over and over fighting with flare ups in that knee. In 2011 I bought a treadmill and started walking. I decided I’d learned my lesson in the past with trying to run, and bringing on the pain, and this time I would just have to settle for being a walker. 2012 found me signing myself up for a 5K race. Not sure what really possessed me to do that, I knew I couldn’t run it. But my husband and I went, and I walked it as fast as I could, and occasionally jogged a little. This was the 2012 Shamrock’n’Roll 5K race in Plymouth, MI. I finished the 5K in 48:22. I wasn’t overly proud of my time, but I was very proud of myself for signing up for it, going and doing it, and finishing it! 🙂 At the time of that race I probably weighed about 138 lbs. and it wasn’t long after that I started putting on more and more weight, leading up to the re-birth of my fitness journey in September. 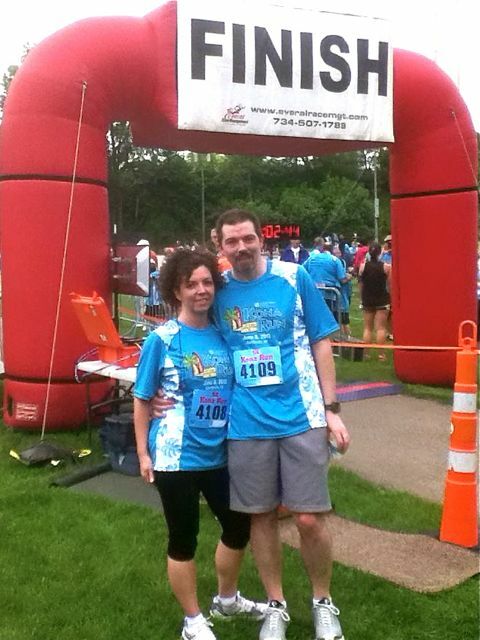 I am not a runner…Or am I? So now, I’ve been using my treadmill for the last 9 months or so. I started out walking very slowly the first month. After a couple of months I decided to try out just a LITTLE bit of jogging. I worked in three 1-minute jogging intervals in my 45 or 50 minute walks. My ‘jogging’ speed was 4.0 mph. Which, is really a very fast walking pace but for me at the time was more of a jog. Each month I would add 30 seconds to my intervals. By April I was doing three 3-minute intervals of jogging, sometimes 3.5 to 4 minutes, and I had increased the jog speed the tiniest bit to 4.1 mph. My knee seemed to be cooperating with this VERY small and slow addition of jogging to my workout. When I got into the month of May, knowing that this race I’d signed up for was in the beginning of June, I decided to up the stakes a bit and see if maybe I could do more running than I thought I could. I started with a week of 5 minutes walking, 5 minutes jogging. The next week I tried 4 minutes walking, 6 minutes of jogging. Then the next week 3/7. Seven minutes of jogging at a time felt like it might kill me, but…my knee seemed to be holding out pretty strong! This gave me hope and determination! Maybe I could be a runner? Running 3.1 miles makes me a runner, right? 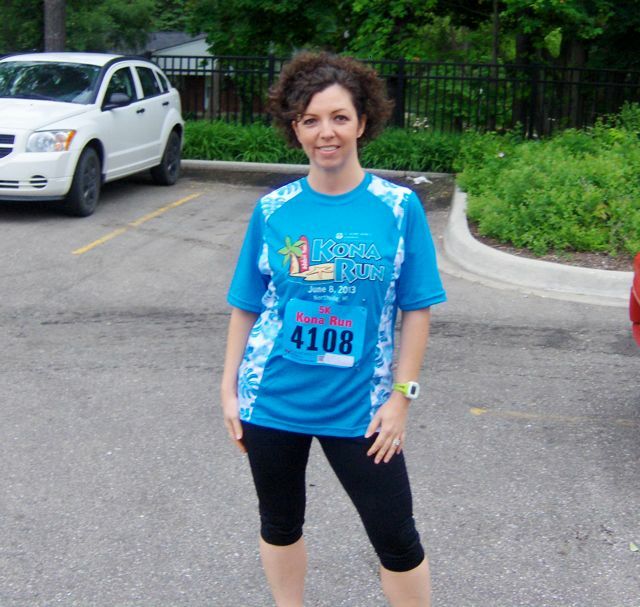 June 8, 2013 finds me standing a the starting line of the Kona Run 5K race in Northville, MI. The race starts at Northville Downs, a horse racing track. We start out with a lap around the track then hit the streets from there. I start out jogging out of the starting gate because, really, who wants to be the one who is walking right from the start right? I am thinking to myself, maybe I could jog all the way around the track then walk as we break out onto the street. We leave the horse track, out through the parking lot and onto the street. I am still jogging. And I’m feeling pretty strong. With my Garmin Forerunner 10 strapped to my wrist, I am constantly checking time, mileage, pace, etc. I decide, as I’m getting a bit winded, that I will walk for just a few seconds. We’ve gone just under a quarter-mile, my mileage reads 0.20. I decide to walk until I get to 0.25 just to catch my breath, it is only the span of a minute or so. Then I start jogging again. We round the first corner and start to make our way uphill. The first 2 miles of this course are mostly uphill. But I keep jogging. My breathing is pretty steady, knee feels good, I keep going. Again approaching half a mile I slow down at 0.45 miles and walk until I get to the half mile. I decide at that point I AM GOING TO RUN THIS WHOLE RACE! The only reprieve I decided to allow myself was at every quarter-mile, just that distance of 0.05 mile to walk and catch my breath. As I am closing in on the last mile I have to admit I was really winded, my legs were tired and I wasn’t sure if I could keep running. Luckily the course was downhill the rest of the way and I started picking up speed a bit without as much effort. The finish area was in a valley down a steep hill, and you had to follow this narrow sidewalk that was winding its way around this park to (presumably) a finish line…somewhere. The problem was it was winding in a circle and you couldn’t really see how far you were from the finish line. I really, really wanted to “finish strong” because this is a mantra that often rolls through my head as I’m working out – “FINISH STRONG! 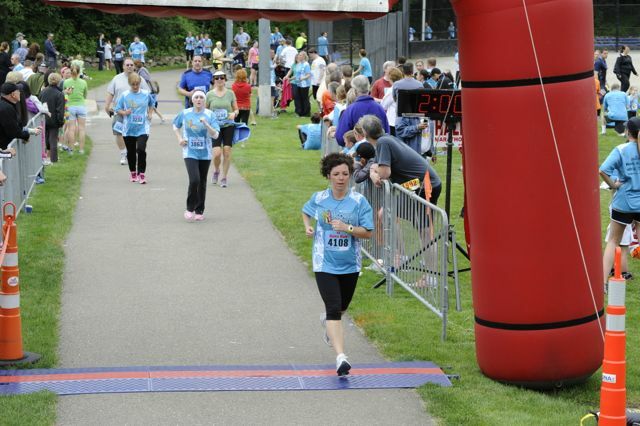 !” But I couldn’t help but start laughing a bit because it seemed like the finish line would never come into sight and I didn’t know how much more “finish strong” I had left in me, lol! Finally, I am sprinting as fast as I can, the finish line is in sight, I hear the announcer call my name as my feet cross over the chip line. I stumble onto the grass at the end of the chute and drop to my knees, breathless and exhausted. I looked at my Garmin and see my time, 38:18 (I didn’t click the stop on the GPS right away so it recorded 3.14 miles, just a few seconds more than the official race time was recorded at.) Tears stung my eyes as I was overcome with joy. I ran that! I ran that whole race! 3.1 miles, I did it!! I am runner at last! During my training, remember I was doing only very short intervals of jogging at 4.0 to 4.1 mph. My pace for this race ended up being an average of 4.9 mph!! It’s amazing sometimes, how much more we are capable of, compared to what we think we can do.